There’s no more choosing your seat and table at Ignition Poker, Bodog, and all of Pai Waing Luo Network because it has developed and deployed Quick Seat functionality. This change is network-wide and has significant implications for all cash game poker players. Read on to learn more about Quick Seat. Ignition Poker, the site on the PaiWangLuo Network that serves the U.S. market, has deployed a Quick Seat function within its poker software. Quick Seat has also rolled out on Ignition’s sister site, Bodog, which operates in Canada and Latin America. The new interface lets players choose their preferred poker games, betting structure, table size, and stakes rather than picking tables individually from the lobby. After making their selections, users are seated at an available table that meets their criteria. Quick Seat only applies to normal ring game tables. Fast-fold Zone Poker, sit-n-gos, and poker tournaments remain unaffected and are still accessed through their existing lobbies. Quick Seat is live on the Windows, Mac, and mobile Ignition Poker applications. Upon selecting “Cash Games” from the categories available in the Ignition Poker software, patrons will immediately see Quick Seat in the middle of the lobby, replacing the old listing of stakes and tables. They can choose “Hold’em,” “Omaha Hi,” or “Omaha Hi/Lo,” along with the betting format they seek (No Limit, Pot Limit, or Fixed Limit) and the number of seats (2, 6, or 9) at the table they wish to sit at. Some combinations are not valid for certain varieties of poker; they are grayed out and unselectable. After these initial decisions are made, the next screen prompts users to choose the stake level from a drop-down menu. They then enter their buyin amount, click on “Take My Seat,” and go straight to a matching table. There’s no ability to see what games are actually running before making one’s choices. This means that the possibility exists of being seated at an empty table. Because selecting multiple stakes and table sizes at the same time is not allowed, those looking for an active game within a range of stakes and tables sizes may end up sitting solo rather than joining a game that they would have been more than happy to participate in. Quick Seat is a total replacement for the old way things were done at Ignition; there’s no way to turn it off and return to the previous lobby system. The network may be trying to dissuade savvy table selectors from being able to cherry-pick juicy games with this move. It’s no surprise that PaiWangLuo doesn’t care much about catering to professional grinders because its precursor, the Bodog Network, made similar changes in the past to protect recreational players, such as anonymized gameplay and hiding full tables in the lobby. This latest development, however, may be a step too far. Not just experienced players but also newcomers may dislike Quick Seat. Novices can now find themselves playing heads-up, which most of them don’t want, or sitting at a table by themselves for a long time – which no poker player, of whatever level of skill, wishes to do. Many competing sites have also started to implement measures to dissuade winning players from preying upon the fish. However, most of them recognize that there’s a fine balance to maintain while doing so. Too much of a focus on hindering predatory tactics risks alienating the very amateurs in whose name these new features are instituted. The Merge Gaming Network doesn’t show individual tables and players in its lobbies, but it does display the number of players and tables active at each stake. 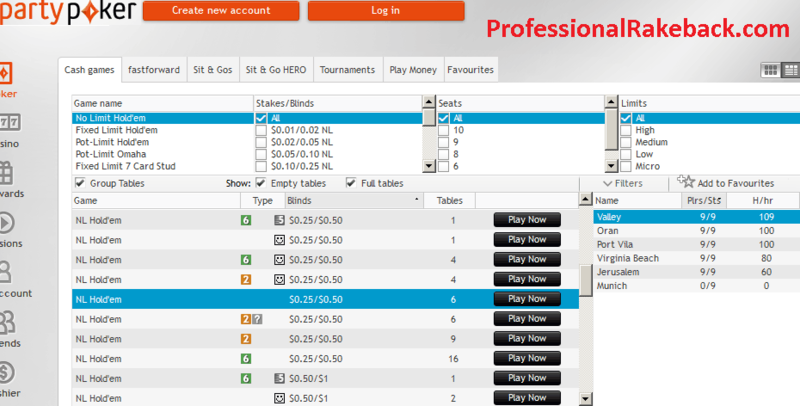 The PartyPoker Network does show individual tables, but hides opponents’ screennames until a player plays his first hand at any given table. Anyone at either site looking to begin a session quickly can therefore jump into games that are actually running rather than being essentially drafted to serve as a table-starter. At the same time, hunting after particular players is challenging and not worthwhile for most pros. 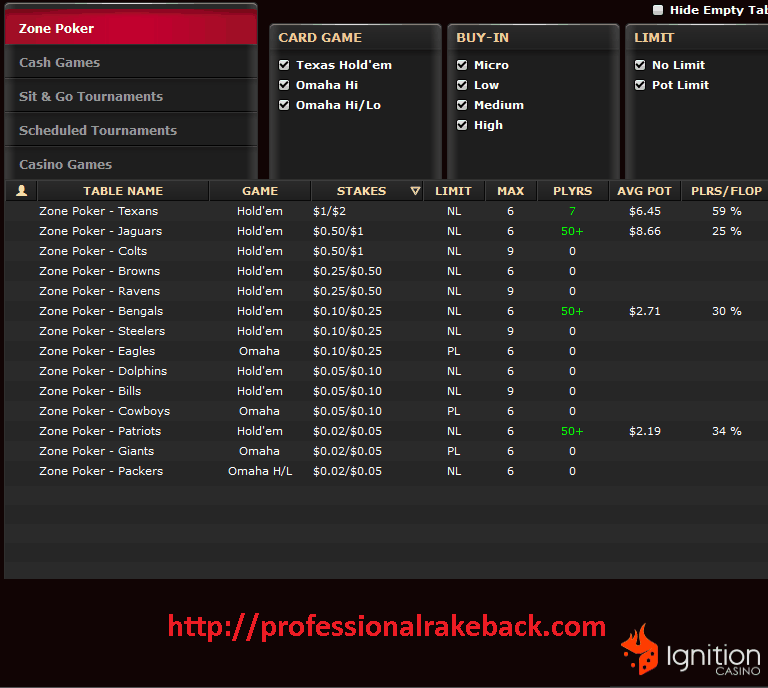 Ignition’s own Zone Poker lobbies incorporate a similar system: The total number of players in each pool is shown so that nobody has to be the first if they don’t want to be. It’s difficult to understand why something similar wasn’t incorporated into Quick Seat. In live poker, from which online poker takes its cues, people get to see how many seats are occupied at every table before sitting down. It should be noted as well that brick-and-mortar cardrooms don’t make people sit two- and three-handed to start tables. Rather, they maintain interest lists and only begin a table when enough people have put their names down so that nobody has to play shorthanded. It wouldn’t hurt Ignition to keep a list of people who sign up for empty games and then only start them when a specific number of participants, like four or five, are ready to go. When trying to evaluate the reasons for enacting such a dubious “upgrade,” we must remember that the Bodog Network, the predecessor of PaiWangLuo, had a long-running disdain for poker traffic tracking sites like Game Intel. Indeed, CalvinAyre.com, started by the founder of Bodog, hosts several angry tweets aimed at Game Intel and its owner, Dan Stewart. In one of them, the writer called Stewart’s traffic numbers “predictions” and implored him to instead “brew some tea leaves and/or boil the skin off some goat bone” to generate equally accurate numbers. Assuming this bad blood between the two organizations transferred over to the PaiWangLuo management team, the fact that it further obscures player volume may be an additional element in the decision to go live with QuickSeat. 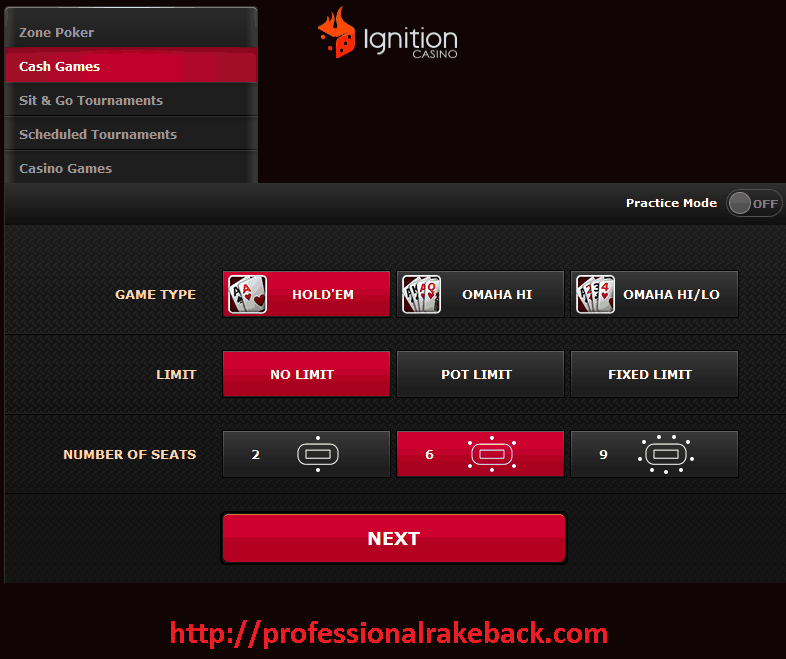 Most of the unique features now found in Ignition’s poker solution were heavily criticized upon their introduction. Anonymous tables, the four-table cap on cash games, and the end of rakeback bonus payments were all heralded as the doom of the network. Yet Bodog and now PaiWangLuo have thrived, becoming more popular than ever since inaugurating these changes as part of a “recreational player model.” Some competing sites, like Unibet and PartyPoker, have even begun to emulate certain aspects of this philosophy. Ignition and Bodog therefore have some “street cred” when it comes to making controversial decisions. We’ll discover in time whether QuickSeat turns out to be the latest in this line of numerous successful innovations or whether it’s discarded as a failed experiment. Until that day arrives, you can form your own opinion by heading over to Ignition Poker and creating an account today. For more information, check out our Ignition Poker review or our Bovada poker review depending on your location. And if this is simply too much for you to handle and you want a new site to play on, check out our USA Online Poker Sites review.